Unique change in severe weather forecast for central Oklahoma Wednesday morning. The change is in the way the low is ejecting into the plains will result in nearly guaranteed severe storm development across NW Oklahoma and S & E Oklahoma, leaving a potential hole in the middle of Oklahoma. 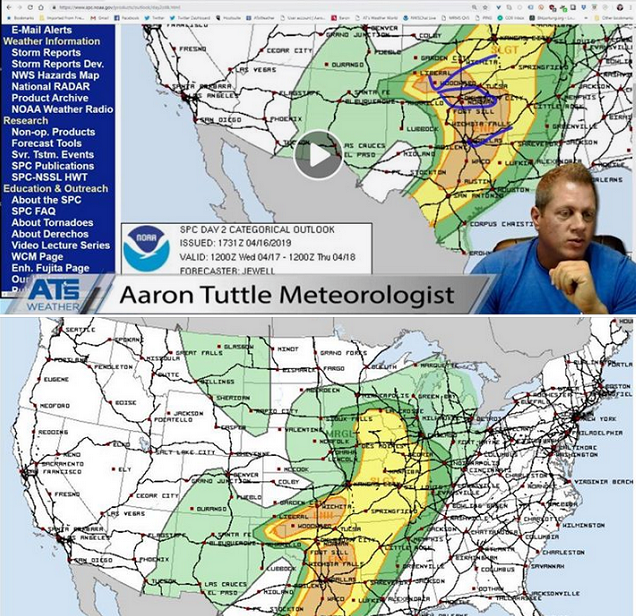 Tuesday night, Aaron Tuttle was on Facebook saying he saw weakness in the model data over central Oklahoma and said the change would likely happen and boasted that it did this morning as pictured below. Well the "hole" is for the wind and hail threat, however, the tornado threat encompasses that. Below average to date: 2.62"
I am not liking what I see, though it is early to reach any conclusions. Yup, been to 98F and 2% humidity today. Winter has obviously taken a hike. I read California filled up most of it's reservoirs to capacity this past winter alone. First time since 2011. They have had a rough couple last few years. Don't talk to me about not enough rain!!!! I'll be grumbling about it by August probably. Feast or famine. I just don't enjoy the famine at all. Wow Dr Robert's. I am from Oklahoma and surprised that your below normal. Having watched the weather in the Midwest I remember seeing you in Kansas having a lot more severe weather than we have had South of you. I know Wichita would get the storm systems heading north of us and building in intensity as they went by us. We are also below normal in severe weather such as Tornado's. We have had some but nowhere as severe as other parts of the country. Well, that was stimulating. A bit of a surprise severe thunderstorm. Gust 61 mph on the VP2 and blowing dust. Visibility 1/8 mile for bit. Nasty stuff. Not much rain, maybe a few hundredths, but thankfully no hail.